Tonight President Donald Trump gives his first speech to a joint session of Congress. It’s not being called a State of the Union speech, because by tradition a President is supposed to be in office a year before giving a State of the Union speech — but effectively, this speech is a SOTU. I’m trying to decide whether to watch. As a general rule, I hate the bloviations and the planned standing ovations and the other political theater that has become part of any presidential speech to a joint session of Congress, and you’d be hard pressed to identify any SOTU speech that was especially memorable. At the same time, even months after his election and weeks after his inauguration, I’m still having a difficult time comprehending that Donald Trump is the President. It’s like I’m expecting that somebody else will step out from behind a curtain. So maybe watching tonight’s speech, and seeing Trump walk down the aisle after the Sergeant at Arms of the United States House of Representatives bellows “Mr. Speaker, the President of the United States,” will help to make Trump’s status as President more real. I don’t expect Trump to say anything particularly meaningful, because that’s not what speeches to joint sessions of Congress are all about. Instead, they tend to be laundry lists of proposals that, for the most part, are never heard from again. When you think about it, the rapid-fire listing of initiatives that we often hear in such speeches is a lot more in line with Trump’s approach to speech-making than, say, what we expect from an inaugural address. He doesn’t need to try to develop flowery language or deliver memorable phrases. The SOTU and other presidential addresses to joint sessions are more like a CEO’s speech to shareholders at an annual meeting for a corporation. Of course, the core purpose of the State of the Union is to discuss the state of the country, and even though this speech might not technically be a SOTU, we can expect President Trump to address that topic. Presidents tend to characterize the state of the union through their own lens, and often what they describe seems to have little to do with what many of us perceive. President Trump probably will say that we’ve got big problems in a number of areas. We’ll hear about immigration, and tax reform, and repealing Obamacare, and trying to keep manufacturing jobs in the United States, and the other themes that seem to be part of every Trump speech. I didn’t watch the Oscar broadcast last night. I haven’t watched it in years, as the broadcast has gotten longer and longer and the speeches more self-congratulatory and tedious. I’m not alone in this — the Nielsen ratings for the Oscar awards ceremony have been falling for a number of years. So, when I saw this morning that the Oscars, through Warren Beatty and Faye Dunaway, screwed up the announcement of the best picture in legendary, unforgettable fashion, I wondered: could this have been done to try to increase the ratings for the show? After all, people like the possibility of surprises. Many Nascar fans go to races in hopes of an exciting crash or two, and lots of hockey fans yearn for a throw down the gloves fight. Reality TV shows are all about unexpected twists and turns that leave viewers talking. If the Oscars is just going to be a bunch of tuxedo-clad and ball gown-wearing stiffs reading cards from an envelope, it’s pretty staid stuff. But if there’s a chance that the announced winner turns out not to be the real winner, and there’s a big, confusing scrum onstage while things get sorted out, maybe people will start tuning in again. It’s hard to imagine how the announcement of the winner for best picture could be so botched. I feel sorry for the people involved in making La La Land, who initially thought they had won, and I feel sorry that the people involved in making Moonlight, which I thought was a fine film, had their moment of triumph tainted by a foul-up. But maybe this colossal screw-up will make Hollywood a little less smug. That wouldn’t be a bad thing. Say Yes To The Dress? We’ve got a wedding in the family coming up later this year. Although the blessed event itself is still months in the future, the time for carefully analyzing and evaluating what dresses should be worn to the wedding and the rehearsal dinner apparently is . . . now! I had no idea that quite so many websites featured dresses for the family members who are attending weddings. Dresses of every imaginable length, cut, and hemline. Dresses with jackets and without. Dresses that feature something mysteriously called a “bodice.” Sleeveless dresses, dresses with poofy shoulders, and dresses with curious slashes, like they’ve been attacked by Freddy Krueger. Dresses in every conceivable color of the rainbow, from azure to lilac, from saffron to magenta, from sea foam to garnet, with every subtle gradation and shade in between. Never has fashion been the subject of such passion. For the husband, there is no avoiding it. When I get home I’m going to be asked to choose between dress styles with subtle differences discernible only to Parisian designers. I’m going to be asked whether I prefer the periwinkle or the lavender, the teal or the aquamarine. And, because every dress website that Kish has accessed has deposited a girl scout squadron’s worth of cookies on our home computer, every pop up ad on every sports website that I check these days features solemn women modeling dresses. Too bad, because I was thinking of something in cornflower. Those of us who’ve been waiting patiently — for years, and years, and years — for the United States to get back into the manned space exploration mode have always thought that perhaps crass commercialism might be the impetus. If governments aren’t spurred by noble thoughts of advancing into the final frontier and exploring for the benefit of all mankind, maybe they’ll be motivated by cold hard cash. With a compelling case for a serious financial return from exploration, modern governments might — like the European nations exploring the western hemisphere during the 1400s and 1500s — be willing to commission a few ships, set sail, and see what they can find. We’re about to get an answer to that question, because in a few years NASA will be launching a mission to a solitary asteroid orbiting between Mars and Jupiter that — all on its own — would seem to make space exploration fiscally worthwhile. The asteroid, called 16 Psyche, is about the size of Massachusetts and has been battered by meteor strikes. It’s composed primarily of nickel and iron. The vast quantities of metal on the asteroid is a kind of treasure trove that causes NASA to say that 16 Psyche is worth about 10,000 quadrillion dollars. How big is a quadrillion? Well, apparently there are about one quadrillion ants on planet Earth. Multiply that mind-boggling number by 10,000, and you get the value of 16 Psyche. Even Bill Gates would be impressed by that sum. Of course, we might not want to cart all of that metal back to Earth, because that would be pretty expensive. We might decide that the treasure trove would be better used to build settlements on Mars, or to manufacture space stations or space craft, or for any of countless potential uses of metal in space. And it’s all out there waiting for the first intrepid country, or group of countries, that is willing to go out and get it. So — why not get back into space, already? We’ve twiddled our thumbs long enough, and you can tell that private enterprise is starting to look pretty seriously at space as an investment and development opportunity. In fact, some people are arguing that, with private enterprise leading the way, we could be back on the Moon, permanently, in four years, and then moving on to other planets in the solar system thereafter. Who knows? Maybe a President who talks about “the art of the deal” couldn’t resist trying to lay claim to a titanic treasure. With all of the bad things happening in the world these days, it would be nice to turn our eyes skyward. I wouldn’t mind a little greed for $10,000 quadrillion if that’s what it takes to motivate us to get back into space to stay. 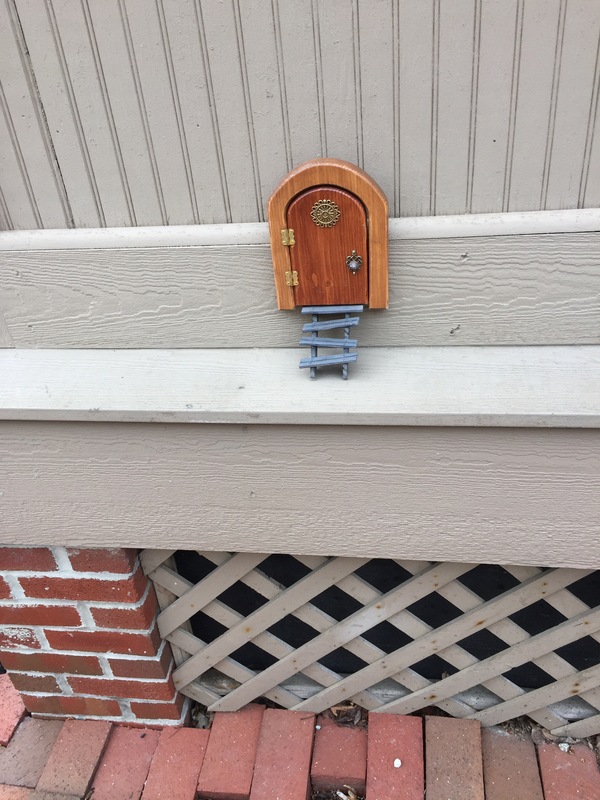 The latest addition to the German Village tiny door club has made its appearance, this time on Macon Alley, near the intersection with Beck. The elf who lives here must be an indolent athlete — sufficiently skilled and vigorous to scramble up the bricks and latticework, but unwilling to repair his rickety front steps. Last night Kish and I were out on the town with the Bahamians, and we decided to hit the Brothers Drake — our first meadery. It’s on East Fifth Avenue, across from The Table and in the rapidly developing area between the ashore North and south campus. 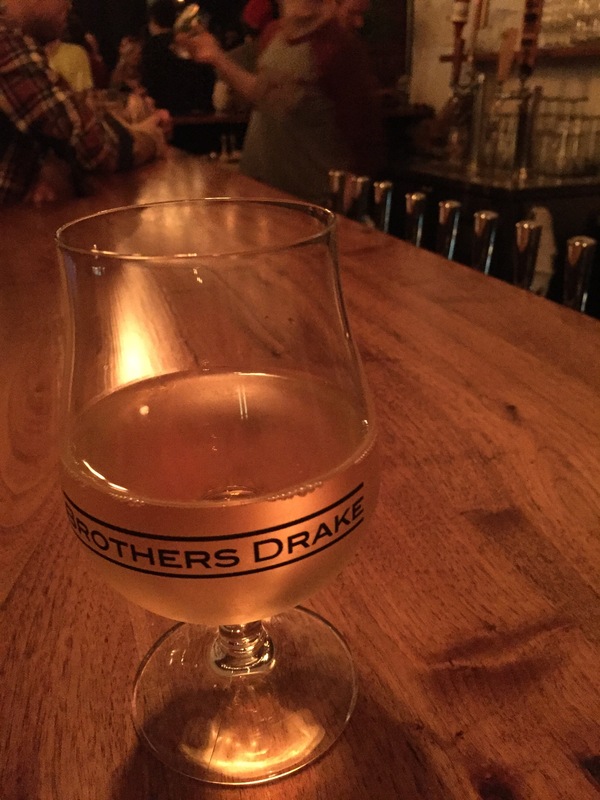 Last night, even with a $10 cover charge, the Brothers Drake was jammed with people eager to quaff a wide range of meads and hear a good band play some live music. We all got our inaugural cups of mead and took a few cautious sips. I’d heard that you have to watch the sweetness scale if you’re going to drink mead — it is made with fermented honey, after all — so I’d ordered a spiced mead that that was supposed to be on the lower end of the sweetness spectrum. Even so, it was too sweet for our tastes — kind of like drinking a dessert wine. I think I could develop a taste for mead, though, with a bit more experience and guidance on the different varieties. I’m glad I gave it a shot.